When your house has tiles in the dining area or in the living room, you might not need to worry about keeping the tiles safe from discoloration or moisture-based deterioration. But there are some areas of your house which are prone to attacks from different types of chemicals, moisture, or see heavy footfalls. 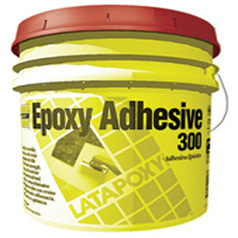 For such areas of your house, you need to reinforce the tiles by adding a good quality epoxy tile adhesive. For such areas of your house, you can go ahead and use tiles without any apprehension, because you can easily add our epoxy tile setting adhesive for the strongest bonds in all your usages of tiles, whether the tiles are being laid vertically or horizontally. They provide great resistance to the high temperatures, humidity, and difficult stains that tiles have to be placed in. You will be amazed to see the versatility of our epoxy tile setting adhesive. You can use epoxy tile adhesive for a wide variety of tiles and materials, like porcelain, granite, ceramic etc. You don’t need to worry if any areas of your house see the presence of harsh chemicals. If the tiles can tolerate them, our adhesives can too. Our epoxy tile adhesive has been successfully used by our clients in kitchens, washrooms, and swimming pools of houses. Epoxy tile adhesive have also been used in large commercial spaces like restaurants, malls, wineries, breweries, distilleries, meat processing plants etc. Our epoxy tile adhesive come to you in two ways. The first is the powdered and dry form, and has three components to it – resin, hardener, and powder. You have to mix the three elements in the right proportion to get the adhesive mortar. Once mixed with mortar, it also begins to set and harden, so you must mix only as much as you need. You can’s store the mixed mortar for later. 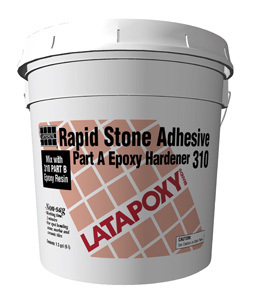 The second category is our premixed epoxy tile adhesive. It is packaged in tubs and is ready to use. If you are able to seal the lid perfectly, you can also use our epoxy tile setting adhesive later. If you are doing the tiling for your house yourself, this is best for you, so that you do not have the hassle of mixing in the right proportion. Although this epoxy tile adhesive is very useful, but please be warned that after setting, it might have a strong odour. Also, you need to be mindful of the fast setting of this product.